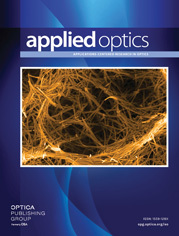 The authors are with Indiana University, School of Optometry, Department of Visual Sciences, Bloomington, Indiana 47405. Ocular chromatic aberration is expected on theoretical grounds to affect the quality of polychromatic interference fringes generated on the retina if the interferometer is not perfectly centered on the eye’s visual axis. Of primary concern is a loss of contrast resulting from wavelength-dependent phase shifts of the fringes. By using an interferometer with just two wavelengths of light, we demonstrated this phase shift directly and measured its magnitude as a function of interferometer displacement. Then, using white-light fringes we measured visual acuity and found a threefold loss of acuity when the light from the interferometer entered the eye near the margin of the pupil. These results are consistent with predictions based on a simple optical model of ocular chromatic aberration. Note: Values for the best-focus experiment represent mean ±1 standard deviation of the mean and for the other experiments they represent regression slope ±1 standard deviation of the slope.